miaow wrote: Anyone else just see Jaques Brunel in the crowd? Who is going to score more Fantasy Rugby points this weekend: Kinghorn or Seymour? What a place to knock on. Dare I say it, we are playing quite well! Good team try and nice finish for King Blairhorn. 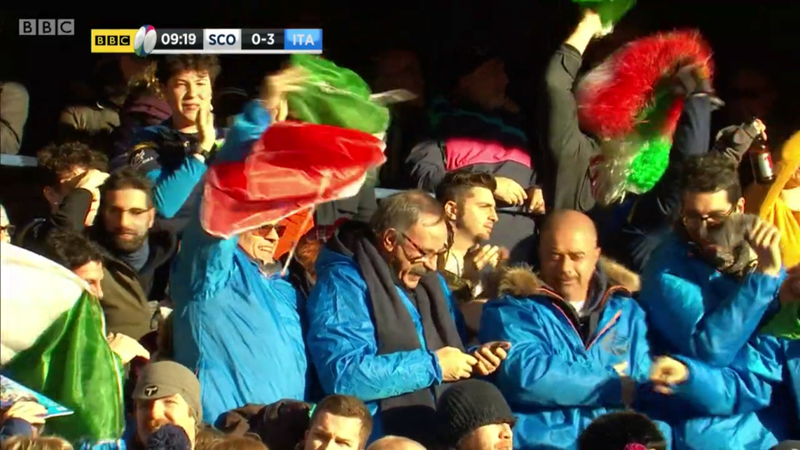 Looks like yet another Six Nations where Italy are going to take five defeats. Was the Russell pass before Hogg passed to Kinghorn look forward to anyone else? Allan doesn't look too good. Really flat atmosphere - all Scotland but lacking intensity. Italy flopping all over the rucks. Parisse won a penalty for putting his hands on the floor. Poor reffing. Not the first time Italy have won one either. Maine man wrote: Was the Russell pass before Hogg passed to Kinghorn look forward to anyone else? What happened to Skinner? I didn’t see it. You do feel like we have the backline to dish up an absolute hammering here. George Carlin wrote: What happened to Skinner? I didn’t see it. Right which one of you is waving the <3 you John Inverdale sign in the background there. Just need to improve the passing, only saw second 1/4 but some of the midfield passes kept stopping all flow and momentum. I like this ref. Very clear and consistent so far. Despite Edinburgh players' best efforts we are winning this game well. Sorry, are my ears deceiving me? Kinghorn has to buy a jug tonight! Blairhorn the hat trick hero. Which erse said to pick Seymour fit the fantasy team? Eejit wrote: Despite Edinburgh players' best efforts we are winning this game well. 21 points from Edinburgh or former Edinburgh players. Ritchie having a good game. Its okay Tattie, Glasgow Warriors are here to save the day. You can have the 1872 trinkets and the meat pies to make yourselves feel better, but we all know where the hard yards are coming from. Scottish guy's doing the radio commentary heavily critical of Huw Jones as he is replaced. Sounds like every time Scotland execute their skills they score. Shug has been utter mince, probably since we beat England last year. Its no wonder Rennie prefers Nick Grigg at club level because at least he doesn't go missing for 9 months at a time! Blairhorn having a stormer! Lovely last try. Eejit wrote: I like this ref. Very clear and consistent so far. God ali price is looking a bit like meatball!